Analysis of Moonlighter for PS4, Xbox One and PC. 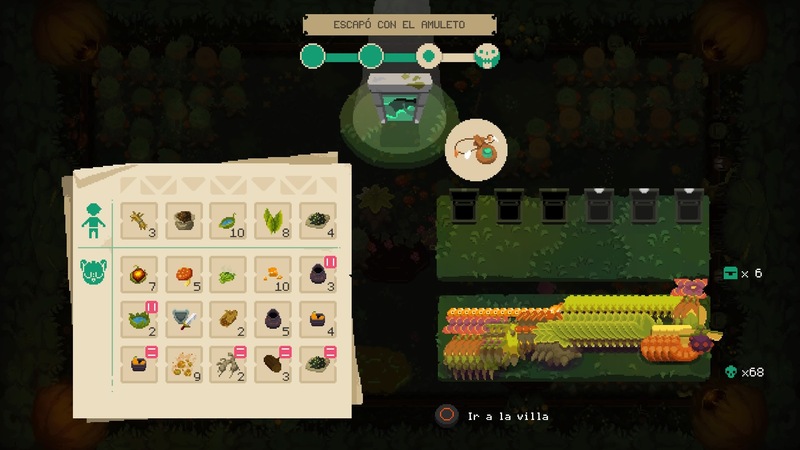 The Spanish Digital Sun give a twist to the genre ‘roguelike’ mixing classic elements such as action and adventure with the management of a store. The result? We tell you for a very reasonable price. And for being you, we give you a discount. 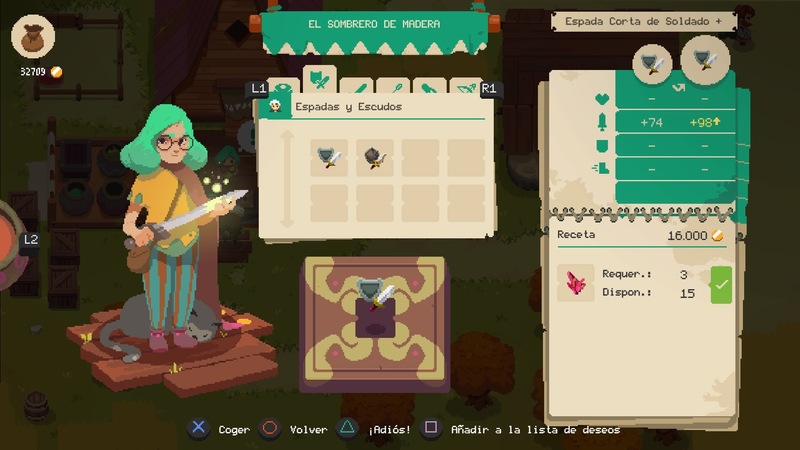 Go back to your cave, dear troll … Or stay and discover in our analysis of Moonlighter how these Spaniards have managed to give a touch of freshness to a genre where it seemed that everything was invented. And they have done so by adding to the formula a facet that, on paper, is as atypical as apparently out of all this of the rogue like : to become managers of a store. Stop there, do not leave yet. We know what you are thinking; We have also been on that ship: ” I have a store, what I want is to kill monsters “. 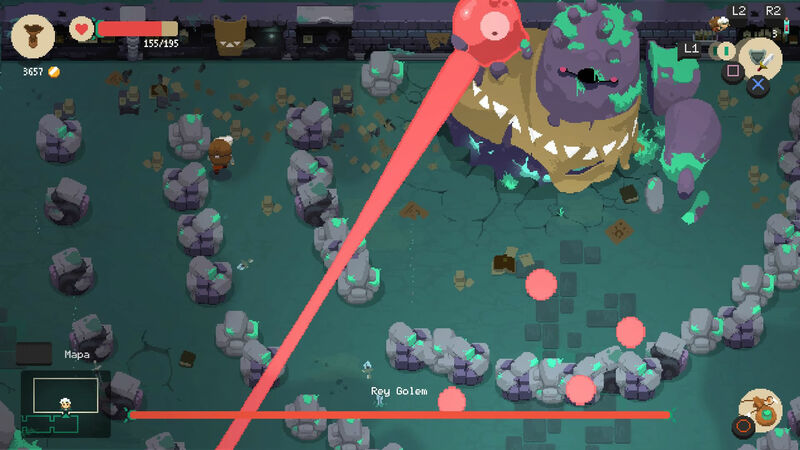 We already warned you that you will be surprised how well taken he is, to the point that it will be difficult to know which part of Moonlighter you have a better time. But first let’s get in situation. In Moonlighter we put ourselves in the shoes of Will, a boy who dreams of becoming a hero … But he inherited his grandfather’s old shop (nicknamed Moonlighter), after he disappeared mysteriously in the dungeons near his town Rynoka Become a hero or attend to the family business? We soon discovered that we can kill the two birds with a single shot. Or a swipe, rather. As aspiring heroes, we can make trips to the dungeons. 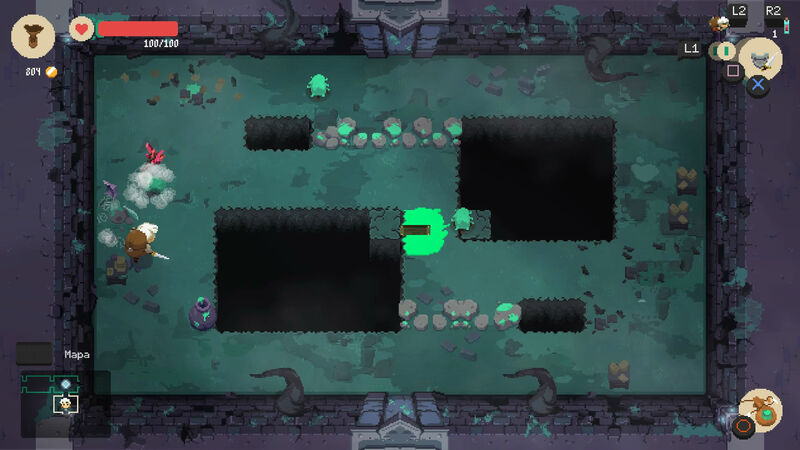 This is the most traditional part of Moonlighter: there are four dungeons, each one more complicated than the previous one and with a different theme. Inside, which is generated randomly (although following certain patterns), we explore and fight against all kinds of creatures, with a combat system that is reminiscent of The Legend of Zelda with an isometric view. Simple but very, very effective. Little by little, the store is growing, which means more customers to attend. And by defeating creatures, we get all kinds of materials … That we can sell. Here comes the part of the store: we can put on sale all those materials, choosing their price. And seeing the reactions of the customers (some nice sandwiches on their heads), we discover if the price that we have put is the suitable one, too expensive or too cheap. As simple as that. We can make Rynoka grow by attracting new merchants, like this witch who will love our weapons … For a small fee. The development of these “phases” is so simple and animated that at no time is tedious. In fact, you will want to return constantly to the store to see your coffers grow. 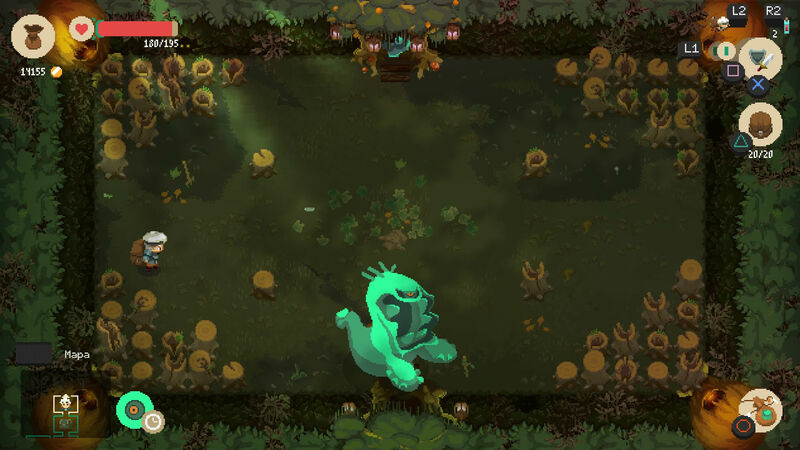 Another interesting aspect is that we must be careful that the heroic facet does not conflict with the shopkeeper, because to get further and further into the dungeons, Will needs better equipment (in Moonlighter there are no levels or experience). And how is it achieved? Surely you have already guessed: forging it with the materials we collect. So there are selling objects to get gold, but choosing carefully what we put on sale, reserving for the store those that are not necessary for the forging of weapons and armor. Given the huge amount of materials we can collect, keep in mind what to keep and what to sell could be a mess of three pairs of noses. Luckily, Moonlighter has an incredibly useful bookmark system that allows us to mark the weapons and armor that interest us, which automatically places a star on its materials. 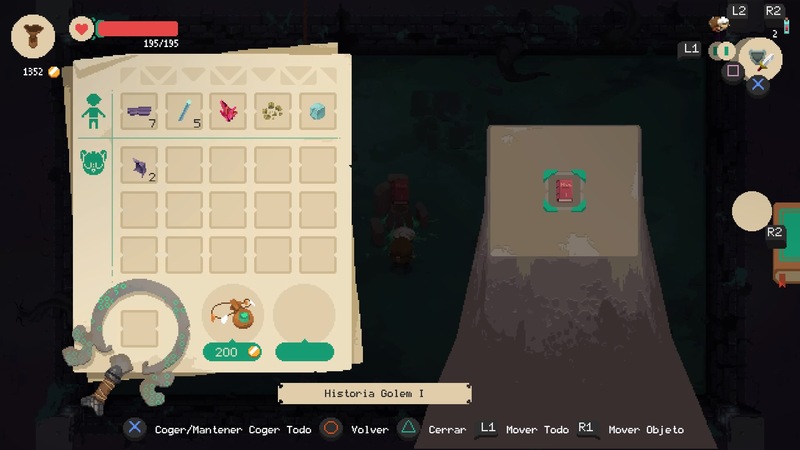 Inventory management is also a very important aspect in Moonlighter , because as you have already imagined, Will’s backpack has a limited space. Here the Digital Sun guys have taken another tremendously original system out of their sleeves, which makes something tedious how to manage objects in a grid turn into a real puzzle. You see a grid with many objects, we, a puzzle that we are proud of. Because a lot of the materials that we find in the dungeons are accompanied by a property and an address. For example, we can find a piece of cloth with a curse that destroys the object on the right when we leave the dungeon, or golem nucleus that can only be placed on the top or bottom of the backpack, or an ingot that copies the properties of the objects that you have right below … In short, organizing the backpack is like playing Tetris. To add tension, when we die, we lose all the objects (except what is located at the top of the backpack). And if we spend too much time in a dungeon, an enemy seemingly impossible to defeat will appear that forces us to get out by feet … Or flee back to Rynoka. In graphics, the jefazos are the most remarkable of Moonlighter … If we manage to get to his lair, of course. Although four dungeons may seem small, progress through them is relatively slow. The dynamics could be summarized as: go to the dungeon, collect all the objects we can, run away, sell, manufacture new equipment and return to the dungeon to, on this occasion, go a little further. That means that Moonlighter involves a certain ” grinding “; It is not too much, and a skilled player could make his way through the dungeons with only a broom … But keep that in mind if you do not see this kind of aspect. In the dungeons, in addition to enemies, chests and other paraphernalia, we also find notes left by other adventurers, such as Pete the Fool, and former inhabitants of the place. Some reveal small (and useful) tips to move forward, and others serve to provide a plot background of the most interesting, allowing us to discover how they got those dungeons there and what happened inside. If “the bug” appears, it is best to run. To put the icing on the cake, Moonlighter has an audiovisual section that dazzles from the start. It enjoys a ‘ pixel art ‘ style of those that make you want to frame, and especially highlight the animations of the bosses. And the soundtrack is not far behind: to give you an idea, we still have not heard a single song that we have not finished humming. Not in vain, after its composition is Alec Holowka, also responsible for the soundtrack of games such as TowerFall or Night in the Woods, and has details very worked, as it is dynamic and change, for example, to approach the different stores that we can “unblock” in Rynoka or as we submerge in a dungeon. To finish off and since it has been put on sale, the guys from Digital Sun have continued working on Moonlighter, released new updates to correct certain faults or improve some aspects (for example, keep the button pressed to sleep, thus preventing us from accessing the chest by mistake). 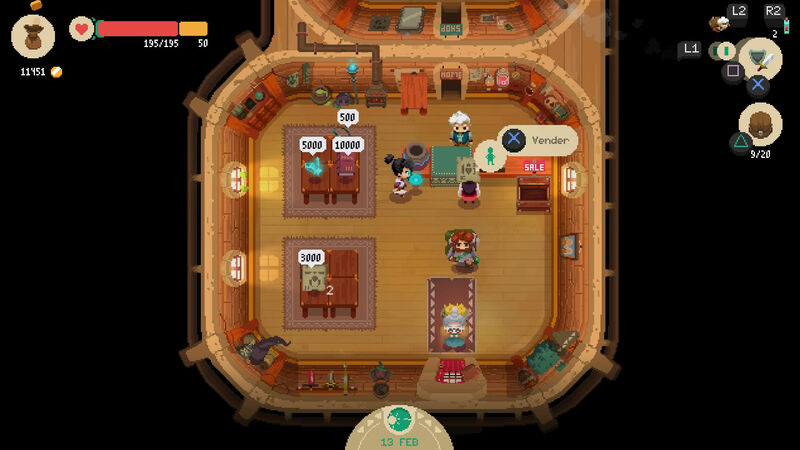 Undoubtedly, a great game that will delight any lover of the roguelike genre or merchant simulators, and that, given its style of play, we are looking forward to playing on Nintendo Switch (version that, by the way, continues without launch date ).